Rudra-Shiva is the ultimate symbol of the environment. He combines in himself the forces of nature and the five elements or pancha bhutas that represent the Indian commitment to conserving nature: air, water, earth, fire and space. 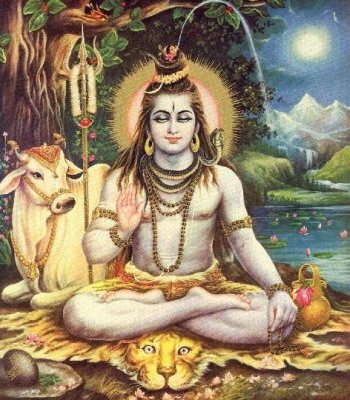 During the month of Shivaratri, when the devout fast and stay awake, meditating on Shiva as the giver of life is meditating on creation itself. The worship of Shiva was an important method of venerating the environment. Many natural forces are imprisoned in Shiva's persona: his flowing tresses represent the forests themselves, trapping within them the mighty river Ganga, the source of perennial water and life. His vibhuti or sacred ash is the symbol of fertility, a gift of the earth. He is invariably painted or sculpted beneath one or several trees, generally the bilva. He is accompanied by Nandi the bull and, often, different wildlife, for he is Pashupati, lord of animals. Shiva is also Bhupati, Bhuteshvara or Bhutanatha, lord of the earth. Bhu means earth and the suffix ta means give in Tamil, so bhuta means ''given by'' or ''formed'' or ''created'' from the earth. Bhuta is the spirit of the earth who is worshipped in rural India. The bhutagavana of Udupi in Karnataka and theyyam of Kerala are bhuta rituals that continue to be popular. As the ascetic rishi meditating on a hill, the mountains become the sacred home of Shiva. The Himalayas, even visually, look like the abode of the gods. Several Shiva temples are found on hills. From Kailasha in the Himalayas to Tiruvannamalai in the south, the country is strewn with hill and mountain homes of Shiva. By sanctifying them, important watersheds were conserved, preserving forests and providing water for existence. So sacred are the hills that no tree on them could be cut. However, this ban is hardly observed any longer, and Tiruvannamalai is a classic case of deforestation, as are the Himalayan foothills, that were once rich with forests and wildlife. Shiva holds Agni or fire on the palm of his hand. It symbolises the energy released during creation. The drum represents the sound Om, the origin of creation. The trishula or trident in his hand represents the feminine half of creation. There is no aspect of this deity that does not invoke nature. The five elements or panchabhutas; earth, air, water, fire and space, are represented by five Shiva lingams, which are famous temple and pilgrimage centres. Earth is represented by the prithvi linga made of mud at the Ekamreshwara temple in Kanchipuram, Tamil Nadu. Due to its fragile composition, the ritual washing (abhishekha) is done with the oil of the champaka flower, not water or milk or sandalwood. The lingam at Sri Kalahasti, near Tirupati in Andhra Pradesh, houses the vayu lingam. The oil lamps flicker away in the wind, so puja is offered to the utsavamurti (festival bronze) alone. At Tiruvanaikaval (Jambukeshwara) near Tiruchy in Tamil Nadu, the lingam stands inside a small shrine beneath ground level, submerged under a perennial underground spring. This is the lingam of water. The fourth lingam, of fire is situated on top of Tiruvannamalai hill. Shiva appears as the jyoti or light on Kartika Poornima day, when a massive ghee cauldron is lit on the hill. For the rest, the hill itself is regarded as Shiva's lingam, making it a sacred natural feature. The fifth lingam is the akasha lingam of Chidambaram. Space is represented as the vast emptiness in which Shiva danced his ananda tandava of creation. There is nothing to be seen in the small shrine. While the lingams within are mentioned in early Tamil literature, dating back 2,000 years, the present temples are magnificent structures that were rebuilt in the Chola, Vijayanagara and Nayaka periods, and are important centres of pilgrimage. However, one wonders how many know the unique symbolism of the temples. There are twelve jyotirlingams dedicated to Shiva which celebrate various aspects of nature. Kedarnath (Garhwal, UP) has a natural lingam, an irregular-shaped rock, in a temple surrounded by the five sacred peaks of Rudra Himalaya. Vishwanath at Kashi is washed by the sacred river Ganga. At Nageswar near Dwaraka, the snake is celebrated as a protector. Mahakala at Ujjain represents the unrelenting march of time, the Destroyer. Omkareswar is situated on an island in the river Narmada. The temple of Somnath in Saurashtra is a dyke along the Arabian sea. The lingam of Tryambakeshwar in Nasik has a crack from which there is a continuous drip of water, with occasional flashes of fire and sound. Grishmeshwar in Aurangabad is the Lord of the torrid summer. Bhimashankar in the Sahayadri hills is ritually washed by an exquisite lotus pond. Vaidyanatha in Parli, Maharashtra, was once surrounded by forests of medicinal plants. Mallikarjuna at Srisailam in Andhra Pradesh was situated in a garden of white jasmine plants. The twelfth jyotirlingam at Rameshwaram is sacred for the 22 fresh water springs situated within the sea. Other temples of Shiva are equally representative of nature. The lingam at Amarnath is made of ice, and waxes and wanes with the moon. The ancient Mauryan-Sunga temple at Gudimallam near Tirupati contains a lingam with an emerging Shiva carved in relief. The God stands on a yaksha, a spirit of nature, surrounded by a stone fence. Most importantly, the statue once stood beneath a tree, out in the open, as did most ancient figurines. The forms of Shiva are also eco-friendly. Dakshinamurti is the teacher seated beneath the pipal tree. Bhairava is always followed by his companion the dog. Bhikshtanar is the free spirit living in the wild open spaces. Lingodbhava comes out of the linga of fire. Ardhanarishvara combines the male and female in a single figure, like the simplest forms of creation where male and female are not distinct. Shiva is also the doctor Vaidyanatha, symbolised by the sacred bilva tree which has multitudinous medicinal properties. The Hindu religion, like all ancient religions, celebrated nature and used religion as a means of protecting the environment. Unfortunately, many of these symbols are forgotten today. We have discarded old traditions without replacing them with anything equally good or better. The loser is the environment, as well as humanity.